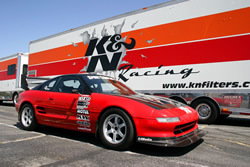 Let WolfKatz Engineering LLC be your local tuning and track setup expert. With years of experience in tuning and automotive data systems, WolfKatz can help you reach your goals. WolfKatz Engineering LLC has hundreds of hours of hands on experience preparing world class race cars and tuning their engines. This experience ranges from the setup and design of custom data systems and fuel injector systems for top tier racing teams in the IRL and American Le Mans series, to hours of dyno time spent tuning these same vehicles. Members of the WolfKatz team have spent countless hours dealing with team crew chiefs, race car engineers, and some of the best drivers in the world. After all, it's of no use having hundreds of channels of data from a race car if you have no idea how to interpret said data! A large portion of the applicable work experience in this area was gained by Mr. Katzenstein during his time spent working as a Support and Systems Engineer at the EFI Technology Inc. It was via his work at EFI that Garrett developed a broad understanding of the working beast that is a modern race car and a modern race engine. Be sure to contact us for more information on how we may be able to help you achieve your projects goals. Note: WolfKatz Engineering does not have a traveling tuner at this time and thus will only support specific projects that are local to the Southern California area. If you believe your project still warrants consideration, be sure to go ahead and talk with us even if you are outside of this area. In simple terms, we can help you dyno tune or prep your car if you are in our area. If you are not, the project needs to be of the proper scope to engage our services! A competition created by Sport Compact Car Magazine to showcase the best sport compact cars found in America today attracts the best from the tuning world to compete in 10 different real world tests. These tests range from dyno, track based performance, and drivability tests, to emissions and fuel economy tests. One of the ultimate sport compact design contests, this one sets other magazine contests apart by forcing the rubber to really hit the road. 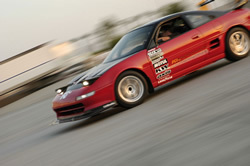 When MR2 fanatic and author of "Car Hacks for Dummies" David Vesprimi contacted WolfKatz Engineering LLC one week prior to the 2005 USCC and said he had been a last minute addition to the competition, we were all ears! 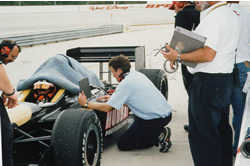 With only one week to prepare, WolfKatz added cams and re-tuned David's engine, rebuilt the exhaust system, completely changed the suspension setup, reinforced the drive axles, and made various other changes to bring the car in closer to compliance with the regulations put forth in the USCC rules (added emissions compliant components, secured various safety items in the car ... ). Although we did not win the competition, we did not break down either. It was a tremendous challenge to get the car ready in with such short notice, but we found 100 whp and still managed to win a portions of the competition (fuel economy) and finish well in other areas. WolfKatz hopes to continue to work with David in the future. Special thanks to Aaron from ATS Racing and Bryan "No Shoes" Moore from NoShoes Speedworks for their invaluable help during this competition. Click here to see a great video of David's car in action during the USCC!